There is nothing more annoying than waiting for what feels like it will never end for an amazing movie or video you want to enjoy on YouTube or just shot to finish uploading to the site so to share with others. Sometime videos from or to YouTube just slow down, get stuck in the middle, stutter a lot, or buffer endlessly. To not spoil the fun and for better experience, users may abandon YouTube in search of a faster site or look for the solution to make YouTube videos load/upload faster in HD/4K. Here we share some useful tips to speed up YouTube videos and increase video loading speed to YouTube. Rather than make do with the YouTube loading problems, you may wonder if there is a way to solve the youtube running slow issue once and for all. Luckily there is an option you can choose: free download YouTube movies and videos for enjoyment with no hassle. To do this, MacX YouTube Downloader is highly recommended for you. With this free YouTube downloader, you no longer need to seek for tips to load YouTube videos faster or stand the annoying YouTube buffering as it can freely download HD video 1080p, 720p, even in 4K 4096P UHD with 100% quality in super-fast speed. Plus, movie trailer/music video can be captured within 30 seconds. Your browser cache are packets of certain information about web pages you visit for quick future visits, which can cause problems when the stored information conflicts with the live content and make your YouTube videos loading slow. Clearing your browser cache, cookies and history not only is good, regular maintenance for your computer but also can speed up YouTube videos and fix many common issues with web-related activities, creating more space on the computer to improve YouTube videos buffering. YouTube videos come in different video formats like 480p, 720p, 1080p and 4k ultra HD. If you are on an excellent internet connection, you can of course enjoy the highest video quality while if not and you want to stay away from the YouTube buffering problem, you are suggested to shift the YouTube to a lower video quality format to suit the lower connection and play YouTube videos faster. For users with slow internet, YouTube has introduced the 144p video quality stream which can help load YouTube videos faster. Google's Web Accelerator tries to accelerate loading web pages for faster viewing through compressing and prefetching pages through Google's proxy servers on the Internet, however, it does nothing to help speed up YouTube videos, but on the contrary, stands in the way to make videos on YouTube load faster. If you want to play YouTube faster, you are suggested to disable, block and unistall your Web Accelerator. When it comes to how to make YouTube videos load faster, the first thing you may try is to close all the other internet activities as you normally would when the internet connection is rather poor. If you are watching YouTube videos or movies and in an attempt to play YouTube videos faster, you’d better close other Internet accessing programs which may run background like download clients, and other activities which you may do simultaneously and may need substantial bandwidth like online web page surfing. In addition to the above tips to speed up YouTube videos, you can also try to change your web browser to get rid of the YouTube buffering. Generally speaking, modern Web browsers like Google Chrome, Firefox or Opera can delivery better YouTube videos viewing experience. After we have discussed on how to make YouTube videos load faster, let's look at another thing users may do with YouTube is to upload the videos to YouTube to share with friends or other people. However, it's not a pleasant experience to spend hours watching the progress bar moving in minuscule increments. In fact, many users are unhappy with the YouTube uploading slow which occurs often. If you are bothered by the same issue, read the tips on how to upload YouTube videos faster below. For a larger-size clip, you're more likely to run into YouTube upload slow issue. It will take less time to upload video with relatively smaller size. So if you have shot a HD/4K video with your HD camera, you're suggested to compress the video size to a smaller one. An improper video format also contribute to the YouTube slow upload. For example, while both formats are accepted by YouTube, a video file with MOV extension is obviously slower than MP4 for its larger size. To compress and convert the HD videos into other formats, you may rely on the YouTube video accelerator MacX Video Converter Pro. This YouTube upload accelerator helps to compress any HD 1080p/720p 4k videos to the smaller size formats like MP4, FLV, WEBM etc with original quality reserved. It's a common sense to get a better internet when users have trouble loading or uploading videos to YouTube. If you want to upload YouTube videos faster with large size, you're suggested to switch your wireless Wi-Fi to a stable connection. A faster internet access can not only speed up YouTube videos and reduce YouTube buffering, but also increase speed. The suggested minimum broadband speed to get rid of the YouTube upload slow is 500kb per second. Adequate storage space will increase the computer's processing speed and improve broadband speed which in turn helps to upload YouTube videos faster. To this end, you will need to uninstall your not-frequently-used program and delete any unnecessary files and other unwanted item on your hard drive. Although YouTube can be loaded on any internet browsers, YouTube upload is not. To make both YouTube videos load and upload faster, it is advised to switch your browser to a YouTube preferred one like Chrome, Firefox or Internet Explorer. In addition to help increase upload speed to YouTube, those browsers can recover the file if timeout or being cancelled. 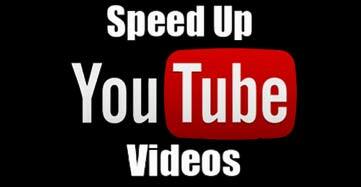 The tips we introduced above on how to make YouTube videos load faster equally apply to speed up YouTube videos upload. They solutions include clear brower’s cache, disable web accelerator, close other online or background activities and programs. Want to upload video to YouTube fast without format problem? You have to get to know the best video and audio formats YouTube supports first. This is where the guide is. If you are annoyed by the slow 4K/HD vdieo uploading speed on YouTube, don't worry, come and check the best video file size for uploading to YouTube first. YouTube puts strick restriction on the video size, format, lenght and more. Check the specific YouTube video upload limits first and then upload video to YouTube flawlessly. MacX YouTube Downloader is an all-around free YouTube video downloader with high quality and incredibly fast speed. It also provides superfast solution to download music videos from 300+ online sites.